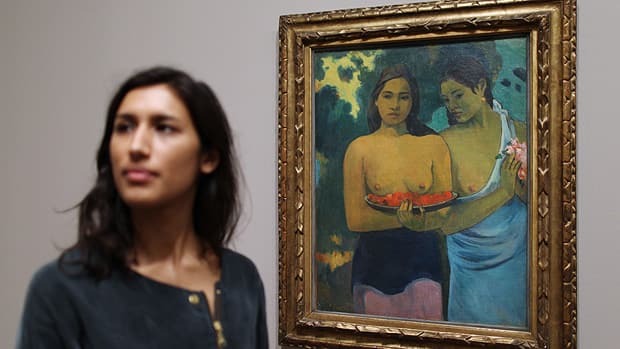 Art experts are closely examining Paul Gauguin's Two Tahitian Women for damage on Monday, after a woman attacked the priceless painting at Washington's National Gallery. According to witnesses, a woman lunged at the painting and tried to pry it off the wall late Friday afternoon. She struck the artwork with her fists and screamed "This is evil," witnesses told the Washington Post. The 1899 painting, which depicts a pair of bare-breasted women carrying fruit and flowers, was protected by a Plexiglas covering. An initial inspection showed no overt signs of damage, but a more thorough examination is scheduled for Monday. The attacker was restrained by another visitor and gallery security officers. Susan Burns of Arlington, Va., was charged Monday with attempted second-degree theft and destruction of property. She's being held without bail pending a mental observation hearing Tuesday afternoon. Two Tahitian Women was loaned to the U.S. National Gallery by New York's Metropolitan Museum of Art for the exhibit Gauguin: Maker of Myth. The exhibit on the French post-impressionist master began in February and runs through June 5.